December 31 is the sixth day of Kwanzaa and the sixth day of Christmas. Kuumba, which means "creativity," is the word for the sixth day of Kwanzaa. Girl: Creativity means thinking of new ways to do things. First Boy: Creativity means thinking of new ways to live in peace. Second Boy: Creativity means finding new ways to love one another. 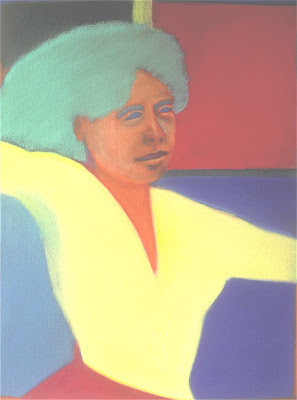 The pastel drawing, originally called "Woman Dancing By Herself," was done by me in the early 1980's. Today I think I'll call it "Let's Pull Together." 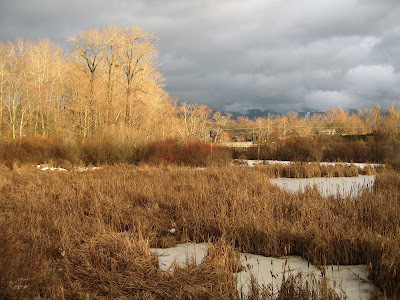 Today is the 10th day following the Winter Solstice, the last day of 2008, with more a little more light, if not sunshine, each day here in the Pacific Northwest. This photo looking to the northeast was taken in the afternoon a few days ago. Most of the snow on the ground has melted, but Scudder Pond is still frozen. Yesterday after sunset, R's sister and brother-in-law and their two dogs arrived here after driving up from the San Francisco Bay Area. Today, last year, I received the letter from her letting me know that R had had a brain stem stroke. Last April, R's brother-in-law's 95-year-old father was in the ICU and hospice in the VA hospital at the same time R was. They died within a few days of each other. We celebrate their lives by living our lives in gratitude. I'm waiting for sunrise so I can show D and P where I've been living for almost 35 years. I hope they can visit again during a time when the sun is shining, and it's not so dark and cold! This extremely cold weather, with snow these past few weeks, is unusual. If my memory serves me well, I recall many New Year's Days when the weather was sunny and relatively mild. I love the winters when it doesn't snow at all. "We celebrate their lives by living our lives in gratitude." I've really been inspired reading your positive and enlightening posts over the last few weeks, am. My own father is in a very bad way - his projected move from the hospital to a respite home today has been delayed due to further complications. Much light, love, joy and creativity in the New Year, am.